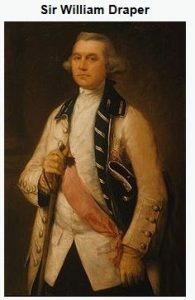 1) (Major-General Sir William Draper, installed K.B., 15 June, 1772). Ar. on a fesse engr. betw. three annulets gu. as many covered cups or. Crest—A stag’s head gu. attired or, charged on the neck with a fesse betw. three annulets gold. Motto—Vicit, pepercit. 2) (cos. Bedford, Middlesex, and Oxford). Same Arms. Crest—A tiger’s head vert tutted or, pierced through the neck with an arrow of the last. 3) (Great Marlow, co. Bucks). Gu. three bends or, a chief per fesse erm. and ar. in chief three fleurs-de-lis sa. Crest—A camel’s head erm. bridled or, maned sa. 4) (Melton Mowbray, co. Leicester, and co. Nottingham). Ar. on a fesse betw. three annulets gu. a mullet of the field betw. two covered cups or. Crest—A cubit arm erect vested vert cuffed and puffed ar. holding in the hand ppr. a covered cup or. 5) (co. Leicester). Ar. on two chev. betw. three escallops sa. six martlets or. 6) (London; granted 1618). Gu. four bendlets or, on a chief per fesse ar. and erm. three fleurs-de-lis sa. Crest—A stag’s head gu. gorged with a fesse betw. two gemelles ar. charged with a fleur-de-lis sa. 7) (granted by Camden, Clarenceux, 1613, to Draper, of Stroud Green, co. Middlesex). Same Arms. Crest—A buck’s head couped gu. gorged with a fess ar. thereon three fleurs-de-lis sa. 8) (Bronlow and Walton, co. Salop). Bendy of eight gu. and vert three fleurs-de-lis or. 9) (Lord Mayor of London, 1567, Sir Christopher Draper. Visit. London, 1568). Ar. on a fess betw. three annulets gu. a mullet of the field betw. two covered cups or. 10) (Lord Mayor of London, 1567, Sir Christopher Draper. Visit. London, 1568). Ar. on a fess betw. three annulets gu. a mullet of the field betw. two covered cups or. Another coat quartered by the same in the second quarter, ar. on two chevrons betw. three escallops sa. six martlets or, quartering also Aucher and Erswick. 11) (London). Ar. on a fesse engr. gu. betw. three torteaux a mullet betw. two covered cups of the field. 12) (Colebrook, co. Middlesex; confirmed 14 Oct. 1571). Or, on a fesse betw. three annulets gu. as many covered cups of the field. 13) (Newcastle). Az. a chev. erminois betw. three mullets of six points or. Crest—A cubit arm erect vested erm. holding in the hand ppr. a mullet, as in the arms.14) Ar. on a fesse betw. two roses gu. an annulet of the first betw. as many covered cups or. 15) (Flintham, co. Notts, and London; Thomas Draper of the former, and his kinsman, Vincent Drapes, of the latter, descended from John Draper, of Flintham, temp. Henry IV. Visit. Notts, 1614). Ar. on a fess betw. three annulets gu. as many covered cups or. Crest—A cubit arm erect habited vert slashed and cuffed ar. holding in the hand ppr. a covered cup or. 16) Gu. two bends or, on each three fleurs-de-lis vert. 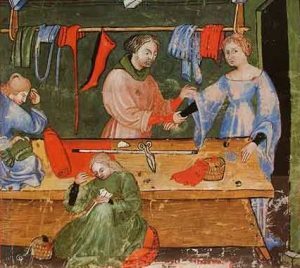 This Anglo-Saxon-French name is an occupational surname referring to a person who was a dealer or seller of cloth, usually woolen. It should be noted the term Aledraper is a cant term applied to the keeper of an alehouse (bar).The name is derived from the Old French word drapier or the Anglo-French word draper. The name was introduced into Ulster, a province toward the north of the island of Ireland, in the 1600s AD. Draperstown, currently of 1,638 people, in County Londonderry was named after the London Company of Drapers who owned land there in the early 1600s AD. Some spelling variants Drapper, Dreaper, Drapour, Drappar, Draeper, Drapere, Draiper, Drapir, Drayper, Dreyper, Drabber, Drabper, and several others. The French version is Drapier. In Dutch, Draper was an old personal (first) name. The name is particular common in the English speaking world (Europe and the New World). The last name Draper ranks 1,397th in terms of popularity in the United States. It is most common (as a percentage of the population) in the following seven states: Utah (where it cracks the top 200), Oregon, Oklahoma, Idado, Delaware, Vermont, Nebraska. The name ranks 1,720th in Canada, 763 in Australia, 691th in England (ranked highest in Hertfordshire and Hampshire), 3527th in South Africa, 1,504th in New Zealand, 742nd in Wales, 1,695th in Scotland, and 1,679th in Ireland. The first known bearer was Hugo Drapier, who recorded in the Pipe Rolls of Hampshire in 1148 AD. The second known bearer of this last name was Robert le Draper (or Drapier) who was documented in the Pipe Rolls of 1181 AD in Lincolnshire. The Hundred Rolls of 1273 AD, a census of Wales and England, known in Latin as Rotuli Hundredorum, documents two people bearing this surname: Roger le Drape in county Wiltshire and Auwred le Draper in county Cambridgeshire. A one Henry le Draper was recorded in the Lay Subsidy in county Lancashire in 1332 AD. Roger le Drapere was recorded in county Somerset during the reign of King Edward III of England (1327-1377) in Kirby’s Quest. The Poll Tax of Yorkshire in 1379 AD records two people bearing this name: Rogerus de Corshawe and Johannes Drapour, who were both recorded as drapours. An early burial record involving this surname was Mr. William Claxston a drapper at St. Mary Aldermarry in London in 1642 AD. A one William le Drapour was born in 1365 in the Netherlands. He had three issue: William le Drapour or Draper, Henry, and John. His son John was born in 1389 in the same country. He married Elizabeth Berkeley and had two children with her: John Rawlyn and Thomas. His son Thomas was born in 1430 in Flintham, England. He had a son named Thomas with his wife whose surname was Aucher. Thomas married Alice Kettleby and had a son named John. John married Agnes Gunston and had two issue: Seince and Christopher. His son, Sir Christopher Draper, was born in 1511 and had two issue: Agnes (Dixie) and Bennet. His son Bennet was born in 1530 and married William Webbe. His daughter Agnes married Wolstan Dixie. Richard John Draper was born in Midgsley, Yorkshire in 1510. He married Alice Townsend and they had a son named Thomas. Thomas was born in 1554 in Hpetonstall, England and he married Grace Newall. They had four issue together: Abraham, Grace, Thomas, and William. His son William was born in 1578 in the same city and he married Grace Mitchell. They had a son named James, born in 1618. James was known as “The Puritan” and he married Miriam Stansfield. He had the following issue prior to his death in Roxbury, Massachusetts in 1697: Miriam, Susanna, Sarah (Hadlock), James, John, Moses, Daniel, Patience (Cass), and Jonathan. His son Daniel was born in 1665 and married Elizabeth Aspinwall with whom he had one son, also named Daniel. This Daniel was born in 1707 and married Rachel Pond. They had a daughter named Abigail Draper, who was born in 1745 and married Jeremiah Dean. Frederick George Draper was born in 1876. He married Annie Gertrude Campbell in 1900 and they had a daughter named Mary Ellen (McCullough). He passed away in 1913 in New Zealand. 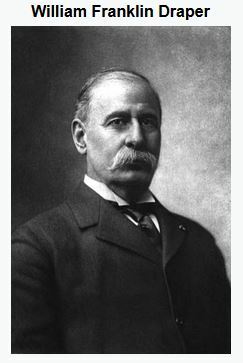 There is a 374 page book called “The Drapers in America, being a history and genealogy of those of that name and connection” that was published in 1892 and authored by Thomas-Waln Morgan Draper. The first page of the book states the following “The Draper, way back in the dim recesses of the past, were natives of Yorkshire, England, and of our near Heptonstall, and undoubtedly all of that name are descended from William, John, and Henry le Drapour. 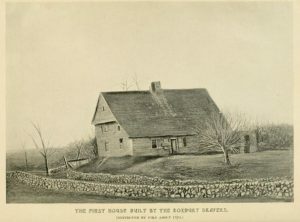 The Roxbury, MA branch is the most easily traced, but all others are equally of the same English ancestry, hailing from other English counties in the later years before emigrating to America, but descendants alike from common parent Yorkshire stem. The native place of the Drapers and Stanfields is a village and Parochial Chaperly in Halifax Parish, West Riding, Yorkshire, England”. The book Genealogical Guide to the Early Settlers, mentions eight people bearing this surname: 1) James Draper of Dedhman recorded in 1683 who was a proprietor in Lancaster in 1654 and was of Roxbury and became a freeman in 1690, who died at the age of 73 in 1697, 2) James Draper of Roxbury who had a child named William in 1686 with his wife Elizabeth, 3) Moses Draper of Roxbury who married Hannah, daughter of John Chandler, in 1685 and had the following children with her: Hannah (1686), Elizabeth (1687), and Elizabeth (1688). He also moved to Boston and had a second wife named Mary, with whom he had a son named Moses (1693), 4) Nathaniel Draper of Damariscove in 1651, 5) Nicholas Draper of Salem in 1637, 6) Richard Draper of Boston in 1690, 7) Roger Draper of Concord who was a freeman in 1630 and had issue Adam and Lydia in 1641, and 8) Clear Draper of Boston, who was 30 in 1634. William Franklin Draper lived in Washington DC and was son of George Draper of Hopedale, Massachusetts and Hannah (daughter of Benjamin Thwing). He was born in Lowell, MA in 1842 and served as a Second Lieutenant in the United States Army who was wounded at the Battle of the Wilderness. He was also a member of Congress and a U.S. ambassador to Italy. 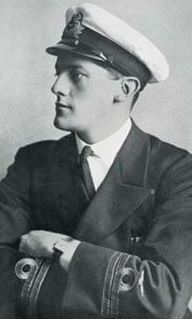 In 1890, he married Susan, daughter of Major-General William Preston, and had six children with her: William Franklin Jr. (1865), George Otis (1867), Arthur Joy (1876), Clare Hill (1876), Edith, and Margaret Preston. He bore the following coat of arms: Or, on a fesse between three annulets gules, as many covered cups of the field. Captain James Draper (1654-1698), son of James Draper of Roxbury, also had the same blazon. His grandfather was Captain James was the son of James Draper, who in turn was the son of Thomas Draper, of Heptonstall, Yorkshire, who came to American in 1647 AD. A one Joseph Drap or Drapper came to the Barbados aboard the Faulcon from London in April of 1635. A one Bartholomew Draper went to Barbados and St. Christopher’s aboard the Anne & Elizabeth in 1635. Thomas Draper came to Virginia in July of 1635 from the port of London aboard the Paule. A one Henry Draper was recorded as living in Virginia in 1623 in Elizabeth Cittie. A one Henrie Draper came in 1621 at age 14 aboard the George and was a servant. Robart Draper came in 1624 in the Jacob at the age of 16 and was also a servant. Other early bearers of this last name include Elizabeth Draper (Virginia 1701) and Benjamin Draper (New York 1841). Some of the earliest settlers in Canada bearing this name were Edward, George, and James Draper who came to Nova Scotia in 1749. The Draper family motto is Vicit, pepercit, meaning “He conquered, he spared”. We have 16 coats of arms for the Oakes surname depicted here. These 16 blazons are from Bernard Burke’s book The General Armory of England, Ireland, and Scotland, which was published in 1848. The bottom of this page contains the blazons, and in many instances contains some historical, geographical, and genealogical about where coat of arms was found and who bore it. Some grantees of arms bearing this last name include: 1) Draper alias Farmer. Bucks, by Cooke, 1422, 2) Christopher Draper of London, Alderman, confirmed in 1560, 3) Henry Draper of Colebrook, Middlesex, son of John of Bedford, granted by Cooke on 14 October 1571, 4) Richard Draper of Middlesex, granted 1558 by Harvey, and 5) Thomas Draper of Stroud Green, Middlesex, son of John, granted on 2 August 1616 by Camden. Famous people with this last name include: 1) Albert Earl Draper (1897-1963) who was a Canadian politician who served in the Legislative Assembly of Manitoba, 2) Christopher Draper (1892-1979) who was an English flying ace in World War I, a secret agent during World War II, and a film star, 3) Waren Fales Draper (1883-1970) who was Assistant (and later Deputy) Surgeon General, and 4) Mary Draper (1719-1810) who was known for the assistance she provided to the Continental Army during the American Revolution.